Best Mobile at this price. Good performance of battery. Good disply quality. Not a good experience for me. Lookwise it is amazing. Thats what attracted me to the phone. Unlike it's previous version, Realme 2 does not have a diamond pattern but I got a nice Ice Lake color. Very soothing. The phone does not get heated up very early. Front camera is good and dual rear cameras are great. I use my smartphone for day to day activities and basic photography. This phone has given me all I was looking for in this price range. Very happy. I have using Oppo Realme 1 from past 2 years. So am excited about Realme's next version. The phone looks great alright but feature wise it offers nothing. Buy this phone if you care about having a better looking phone than performance & specs. 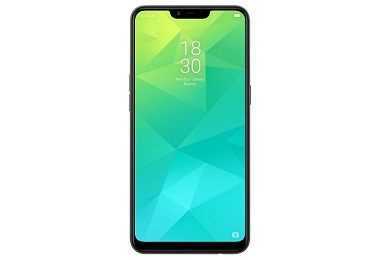 This phone runs on ColorOS 5.2, based on Android 8.1 Oreo. Seems like this OS has lots of bugs as it crashes a lot. Latest price of Realme 2 64 GB in India was fetched online from Flipkart, Amazon, Snapdeal, Shopclues and Tata Cliq. 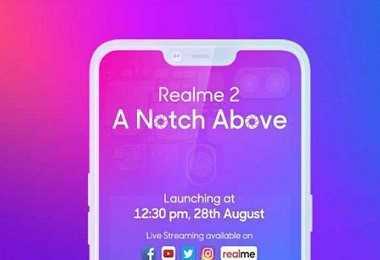 "Realme Phones Will Now be Sold via Official Online Store and Select Offline Stores"
"Realme 2 Launched at Rs 8,990, First Sale On September 4"
"Realme 2 Set to Launch Tomorrow as Flipkart Exclusive: Everything You Need to Know"
Scouting around for smartphone that is light on the pocket but offers the best in specs, features, and design? 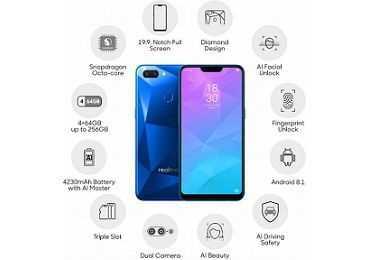 Realme2 (64 GB) from the new Chinese entrant (Realme) into the smartphone domain is a good option. An upgrade over its predecessor Realme1, it is one of the best gadgets you can grab in the budget segment right now. Crafted to perfection, complete with amazing specs, stellar battery life, dual rear camera, fingerprint reader and a stunning design, the powerful handset has everything to provide a truly exceptional user experience. Thanks to the notched panel, the screen is larger with bright colours and wide viewing angles. On the flip side, the display is reflective; hence sunlight legibility is affected. The handset, powered by a 1.8 GHz Octa-core Qualcomm Snapdragon 450 along with a 4GB of RAM & Adreno 506 graphics processor ensures smooth operations. There is no hint of lag even with multiple tasking and intensive apps in the background. Overall, the Realme2 shows promise and has the potential to handle mild usage with ease. The Realme2 64 GB Price is outfitted with a dual camera at the back. You get a 13-megapixel primary snapper + 2-megapixel depth sensor with LED Flash and f/2.2 aperture lens. The secondary shooter is to intensify the bokeh effect to images. Equipped with features like HDR, Portrait Mode, AI Beauty, Phase Detection Autofocus and Face Detection, the smartphone captures good, clear photos in natural light. On the front, there is an 8 MP camera for video recording and handling your selfie needs. The device boasts a huge internal capacity (64GB). Also, there is a provision for external storage to be expanded up to 256GB via a dedicated micro SD slot. The device excels in the battery department. It works on 4,230mAh Li-ion power unit that offers nearly 2-day backup on a single charge for average to medium usage. The phone comes with AI Power Master to maintain efficiency along with a 10 W charger that takes about 3 hours to top up the battery. Regarding aesthetics, the Realme2 is a winner. Available in three colour options (Black, Blue, and Red), the phone flaunts a spectacular back panel made of fibreglass with a chic diamond-like finish. Weighing 168 grams, the device is lightweight, yet pretty sturdy with curved edges for a firm grip. The Realme2 features a 6.2" (15.8 cm) IPS display with a resolution of 720 x 1,280 pixels and 271 PPI. The screen-to-body ratio is 18.8% and aspect ratio 19.9. The colours are accurate and content pleasing to the eye. The screen is covered with a scratch resistant glass for protection. In terms of connectivity, the Realme2 64GB price doesn’t disappoint. It carries two SIM cards (4 G networks) and supports VoLTE services. The device also has features like Wi-Fi 802.11, Bluetooth v4.2, GPS/GLONASS, micro USB 2.0 and more. Other significant highlights include Facial & Fingerprint Scanner, Smart Drive, Smart Unlock, Smart Assistant, AI Board, Password Privacy and a number of customisation options. The Realme2 runs on Android 8.1 Oreo which is based on ColorOS UI. The interface integrated with some exciting specs is user-friendly and refined.